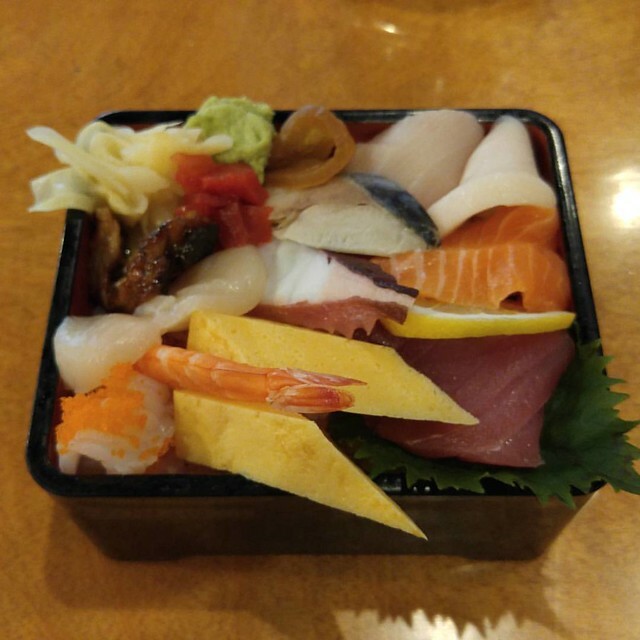 I'm working my way through the restaurants here and in nearby cities that have chirashi bowls, and one place I've had my eye on is N'Joy Sushi down in Mill Creek. I don't make it to Mill Creek as often as I used to when we lived in Silver Lake, because back then, we were about five miles closer. But my friend Lisa wanted to go out to lunch, and she lives in Lynnwood, so I figured I'd see if she wanted to meet there, and then I could do a little shopping at Central Market afterward. She was game, so I headed down. I realize now that I thought I'd looked up their menu before, but it turns out it was Sushi Zen that I remembered. The menu online at N'Joy lists theirs as even more expensive, and then when I got there, it was actually three dollars more than what they list online. All of which adds up to it being about ten dollars more than the first one I ever had! And totally not worth it, because it was maybe just a touch better than that one. Mill Creek is an upscale community and I blame the difference on that. But I'm not ready to say I won't go back, because they have a dish they refer to as Korean chirashi, and it's decently priced, on their lunch menu. We shopped through Central Market and I got some fun stuff, then I drove back via the highway, figuring the afternoon traffic might be a bit much on the surface streets.